Envelopes may be printed for mailing letters to customers, or mailing checks to customers or vendors. The Envelope Setup is available in >> >> >> . 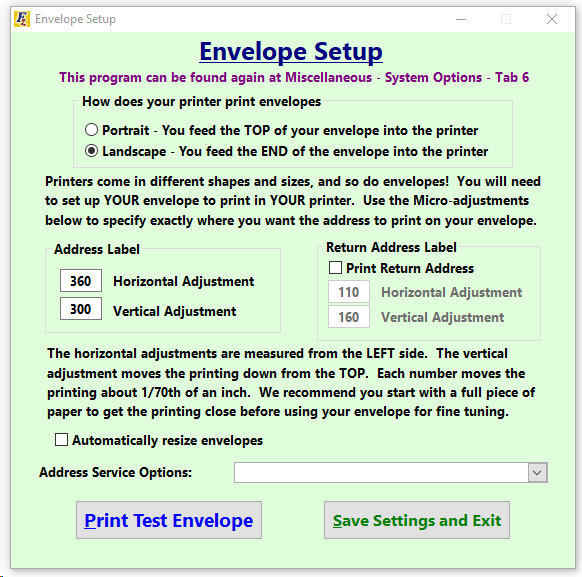 *Because each printer is different, it is recommended that a standard blank piece of paper is used to set up the printable area before trying to on an actual envelope! That way adjustments can be made to fit the type of envelope to be used. Envelopes may be printed from several different locations within Frazer. To print from the Letters and Labels program, go to Customers >> 2 - Letters and Labels >> . Select the Envelope option. To print from a customer's file, go to then select the customer and click on . To print an envelope for a vendor, select a vendor from the Vendor File (accessed from several places in the program, one of which is Vehicles >> 5 -Vendors. Click on .